Robertson's Rules of Disorder: Italy invades France! News at 11! Photos from the game today! Italians with three carri platoons, semoventis and artillery support assaulted forward into France. France responded by sending a full three platoons from one of the Brigades de Chars de Combat of Char B1 bis tanks a metropolitan infantry company and two forward deployed foreign legion platoons. Quite a slug fest, but the Italians pushed forward and captured one objective. Here you can see the assault forward of the Italian medium tanks on the heights held by the French in the face of a platoon of Char B tanks. Two of the Chars are bailed out. The remaining Chars would have a field-day and destroy the Italian platoon on their bound. The Semoventi's in the left of the photo have already found out that they are no match in a gunnery duel with the massive French Chars! 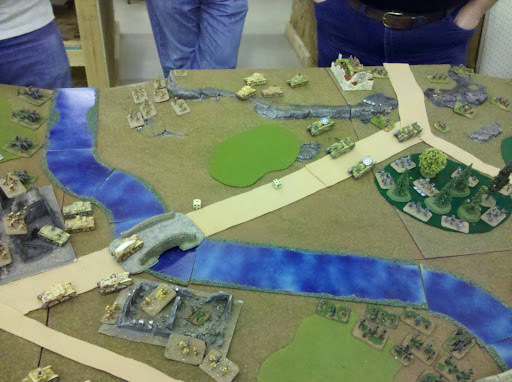 The Italian infantry platoon on the bottom right of the photo will later ford the river and assault the woods filled with French Foreign Legion troops. The Legion would do what it always did, it would die rather than retreat - and in this instance they killed all of the Italian troops in that Bersaglieri platoon in a heated close assault.